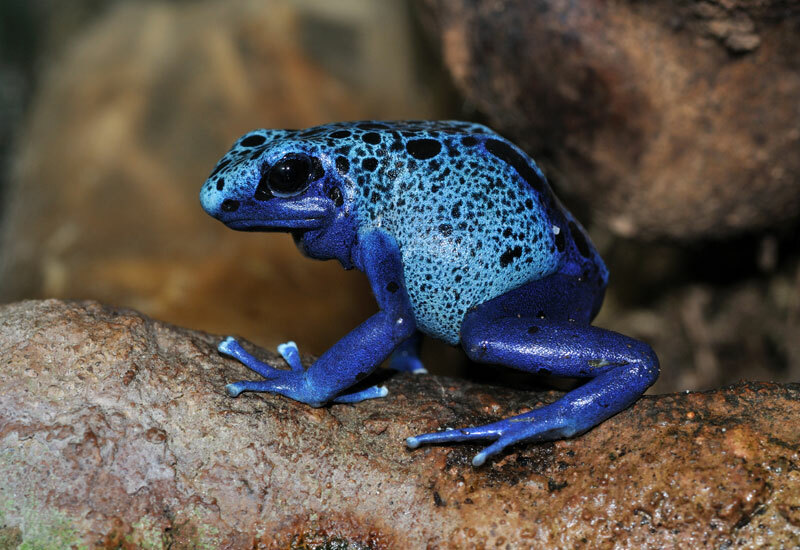 The blue poison dart frog or blue poison arrow frog, Dendrobates “azureus”, is a poison dart frog found in the forests surrounded by the Sipaliwini savannah, which is located in southern Suriname and adjacent far northern Brazil. D. “azureus” is a medium-sized frog that weighs about 8 grams and grows to 3.0-4.5 cm in length. The frog has a typical lifespan of four to six years in the wild. Its bright blue skin, usually darker around its limbs and stomach, serves as a warning to predators. Although poison dart frogs are known for their skin toxins; in captivity, the frogs lose toxicity as a result of altered diets.